Some businesses completed their recovery from 2018's flooding just days before they learned more was on the way. AURORA, Ind. — Every time the Ohio River makes its way to the front door of Kevin’s Hoosier Auto Repair, owner Kevin Caudill marks its height in black on the corner of his building. The highest of the marks, which Caudill can’t quite reach with his feet on the ground, was made after the water rose to 64 feet in 1997. The second-highest, 60 feet, was in 2018. Caudill had to repaint after that — not just because of damage, he said, but because his entire shop smelled like fish. “We shut down” during the flooding, he said. “We were down about a week. I’m very fortunate. The gas station next to me, it was a huge mess for him." Wayne Kennett, who owns that gas station, didn't argue. The flooding forced him to remove his gas pumps ahead of time and spend months rebuilding. 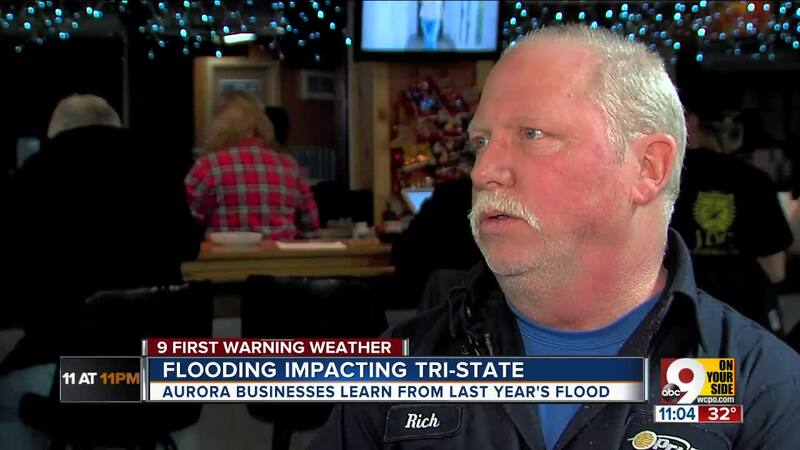 He and Kennett were ready Tuesday night, when the river reached a high of 55 feet, but they and other Aurorans were still anxious about the prospect of more flooding. Members of the Aurora Moose Lodge, a social club just yards from the river, may have been more anxious than most. They celebrated the grand re-opening of their space Monday, having spent $57,000 replacing ceilings, floors, walls and equipment after the 2018 deluge. He spent the next seven hours carrying items out of the building as the water rose first over his ankles and then over his knees. The lodge wouldn’t reopen at all, even partially, for three months. Other members surrounded the lodge in sandbags and installed a new sump pump Sunday afternoon to minimize the damage in case of a repeat. Still, if the water reaches 57 feet, the Aurora Moose Lodge will have water inside.